What an interesting ride Sidonia no Kishi has been, initially this anime was recommended to me by someone on BasilMarket in a anime recommendations forum. I did no research on the anime other than reading comments that said this anime was really one of the under appreciated and best of spring 2014. So I downloaded the anime that summer but didn't bother to watch it until a year later. After watching the first episode I had my doubts about continuing with the anime since the computer graphics where so not what I'm accustomed to and to be honest not that appealing when you first place your eyes on it. But thankfully I was able to get over that and enjoy a spectacle of an anime. The story of Sidonia no Kishi is as follows, human life has been wiped out by a very large species name Gauna; and the only life forms left are a small population of humans moving trough space on a ship named Sidonia. For the people of Sidonia to survive they need to fight against the monstrous Gauna who are out to eliminate the rest of the human species. Sounds a lot like Attack on Titan or Black Bullet am I right? To me it is a lot like Attack on Titan and Black Bullet however Sidonia no Kishi is just set in a different environment, and has better plot development. Knights of Sidonia takes place in space whereas Attack on Titan and Black Bullet takes place on Earth. In short, the story essentially follows the protectors of Sidonia and their fight against the Gauna to prevent human extinction. As I mentioned earlier, I was contemplating whether or not to continue watching this anime or dropping it after the first episode because of the fact that I was turned of by the art and animation. I assume that most people watch anime for a combination of great animation and great storytelling. If either one of those two elements is missing it's difficult to appreciate any anime. Oddly enough I kept going at this anime in spite of my dislike towards the animation. To describe the animation in a couple of words I would say it's a combination of 3D and 2D graphics, not the best description but you can kind of get the gist of the animation based on the cool gifs I posted. Although the animation was different, I will admit that by the end of Sidonia no Kishi, I kind of liked the animation and was thankful that it was animated in a 3D like fashion since I can't imagine it being animated like the majority of anime out there now. The way the anime was animated and brought to life made perfect sense to me now, and when you look at the animation of the ships and devices there is no doubt in my mind a pure 2D animation would do this anime NO justice. The art and animation was different at first but after the third or fourth episode it will grow on you. Rarely do I ever watch anime and listen to the opening credits or the ending credits, I usually just listen to them in the first episode then skip them. The opening for this anime is named sidonia (シドニア) composed by Japanese musical duo, Angela. Really, really, really enjoyed the opening credits, at times if I was preoccupied and doing other things while watching this anime I would in fact listen to the opening credits, since the song was that good. The ending theme was named show by Eri Kitamura. Not the best ending, since the song was not my taste. 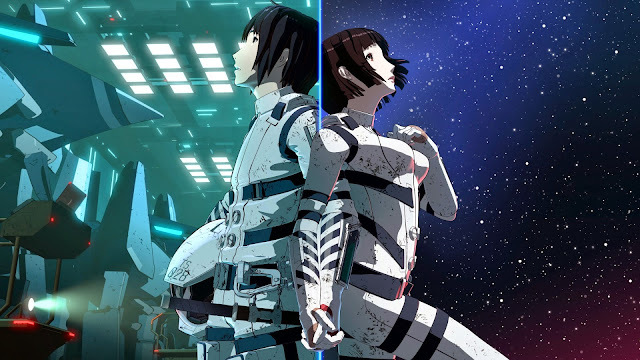 The OST however was very reminiscent and sort of reminded me of music from the Star Wars franchise; not my tastes again but it was form fitting to Sidonia no Kishi since it was an anime based in space. Characters are very interesting in Sidonia no Kishi. We have Nagate Tanikaze as our protagonist then we Izana Shinatose as another main in the series. The majority of the citizens of Sidonia are termed humans but with special abilities like asexual reproduction, and being able to harvest energy for food from sunlight through a process called photosynthesis (yes humans in this anime can perform photosynthesis). However unlike the rest of the habitants of Sidonia Nagate is the only human that isn't able to perform photosynthesis or asexual reproduction; which in my books makes him a normal human being. He is a knight of Sidonia and unlike the rest of the saviours of Sidonia, he seems to be the one with the most talent when it comes to slaying Gauna. Izana is the other main character in this anime and like Tanizake, she is a soldier of Sidonia set out to fight Gauna as well. She is not a pure human like Nagate, and in my eyes she doesn't really play a big role in the anime. She seems to be just a person who plays a supportive role along side Tanizake. When looking at all the characters in Sidonia no Kishi, no one really stands out to me. It's not just one character that everyone likes and continues to tune in because of that one character; it's the combination of all the characters working together that makes the anime good to watch. Overall I have to say this anime was a nice surprise. I'm not into the mecha or space genre of anime but Sidonia no Kishi seemed to open my mind a little more when it comes to this genre of anime. I'd recommend people to watch this since I assume most people never really watch anime like this. It's nice to try something different and get out of your "anime watching comfort zone" and watch something unique. Anyways thanks for making this far into my Sidonia no Kishi anime review. If you read up to here thank you and I'll be working on the next review for you to read! Comment down below your thoughts or tweet me at animedecoy on twitter. Thanks again.